Ottawa is the county seat of LaSalle County, in north-central Illinois. 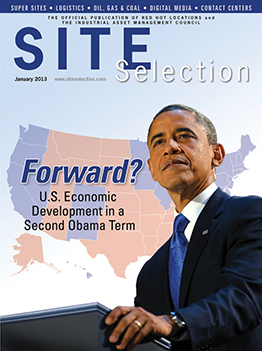 omprehensive logistics assets and a desirable work force are two criteria common to most site selectors’ wish lists. In LaSalle County, Illinois, that combination is driving corporate expansions and a new Community Technology Center at Illinois Valley Community College — the area’s primary higher education center and work-force training supplier. The county’s proximity to several major metro areas, including Chicago (Rockford, Joliet, Quad Cities, Peoria and Bloomington are the others), gives companies access to those areas’ talent pools as well. Finding qualified, trainable labor is not the challenge it is in many other Midwestern markets, say local executives at expanding enterprises. An expansion at Eakas Corp., for example, will add more than 100 jobs to its current roster of 150 in Peru, in the western part of the county. The plastic injection molding company has made parts, such as door handles, for the automotive industry at the site since 1991. The expansion involves a new plating line. Existing customers include Mitsubishi in Bloomington-Normal and seven Toyota facilities; the new plating line means new business from Honda, Nissan and GM. The 280,000-square-foot expansion will more than double the size of the existing, 250,000-square-foot plant when complete this winter. Production will commence in August. Ottawa is the county seat and home to a U.S. Silica sand facility that recently concluded a $50-million expansion that added about 50 jobs to the site’s 120-strong work force. Until recently, says Jon Sheridan, plant manager, the operation ran five days per week and on half a year’s Saturdays. Eakas Corp. is expanding its Peru facility in LaSalle County where it makes injection-molded parts for nearby automobile manufacturers, including Mitsubishi and Toyota. A new plating line will result in additional customers, including Honda, General Motors and Nissan. the Dakotas and other locations. Plants that can produce the proper sand product for these customers are seeing enormous demand, which would be very hard to meet without the area’s logistics advantages. “We are equidistant to those main customer locations,” notes Sheridan. Much of the crop was cultivated at Illinois Valley Community College (IVCC), established in 1924, making it the second oldest community college in Illinois. “We are the only post-secondary institution within about a 50-mile radius, so most people in the community connect with the college in some way,” says Dr. Jerry Corcoran, president of IVCC, which serves about 8,000 credit students annually and about 3,000 non-credit students. IVCC is in the midst of building a new, 80,000-square-foot Community Technology Center that Corcoran says has grown out of the local needs of people for career and technical programs. “Many of our students come here for a one-year certificate or a two-year associate’s degree in applied science, and then they are ready to go to work,” he says. Staff will move into the new center in the summer of 2013 with several programs set to commence in the fall. “There is a lot of evidence to support these technical programs, nine of which will be housed in the new Community Technology Center,” says Corcoran, including Computer-Aided Design, Computer Numerical Control Manufacturing, HVAC, Industrial Maintenance, Electronics, Industrial Electricity, Networking and Computer Repair, Operating Systems and Wind Energy Maintenance. Illinois Valley Community College is building an 80,000-sq.-ft. Community Technology Center that will be home to nine technical programs when it opens in 2013. Partnerships with local companies provide students with internships or apprenticeships that help them get their foot in the door. IVCC has these partnerships in place with such manufacturers as Illinois-based Caterpillar, who help make the case to students and prospective employees that they cannot be hired until they acquire the very skill sets available at IVCC. This investment profile was prepared under the auspices of the Illinois Valley Area Chamber of Commerce and Economic Development. For more on investing in LaSalle County, visit www.ivaced.org.